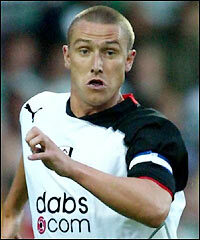 Fulham skipper Lee Clark aims to lead the Cottagers to their highest finish in the Premiership. The club have defied pre-season predictions of relegation and are ninth in the table with just nine games left. "We were at the start of the season looking to avoid relegation, but I think we can safely say we've done that," said the 31-year-old. "Our target now is to stay in the top 10 and finish in the highest position in the club's history." The Cottagers were only promoted to the Premier League in 2001 following a 32-year hiatus from top-flight football. In their first season, under French manager Jean Tigana, they finished 13th. Patchy performances on the pitch last year led to Tigana's exit and the side skirting dangerously close to relegation before current coach Chris Coleman guided them to safety and the final position of 14th. Impressive results this season, including a 3-1 at Old Trafford back in October, have helped them remain in the top 10 and within reach of a place in Europe. "We'll take it step by step," the midfielder added. "Finishing in the top 10 would be the first step, and then if we are in the European positions with a few games to go, why not push on from there?" Clark also indicated he was almost back to full fitness after missing the last two games through injury. "The injury's coming on very well, but whether I'll be ready for the match against Manchester City on Saturday, I'm not too sure. "I'm very confident for the Birmingham game on 3 April though."